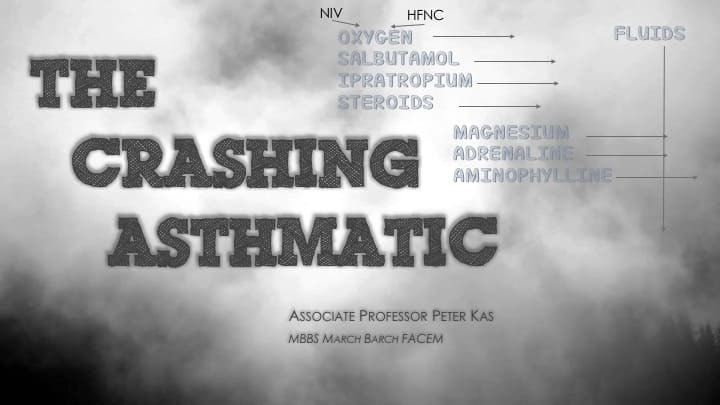 The Crashing Asthmatic Patient is perhaps one of the most frightening of patients to treat. I’m not talking about the patient that has wheeze and gets five or six nebs and gets better in an hour. I’m talking about the sweaty, drowsy, tiring, non-responsive patient that you know has a good chance of dying. Here is a case we had recently that tested the whole team. It was one of those cases where the patient was sitting on the precipice of respiratory arrest for the whole time and the one that you know wasn’t going to do well if they were intubated. On arrival to resus, I see a sweaty, 15 year old girl, sitting up, her eye closed, her chest heaving as she tries to get a breath in, of the mist that’s coming from the salbutamol-filled mask. Her hair is matted and stuck to her forehead. She doesn’t respond, except for an occasional opening of her glazed eyes, when her mother calls her name. The monitor reads heart rate 127, Blood pressure 115/62, RR 46, Sats 70% on 6L/min. A quick story: Been unwell since this morning with a viral illness since yesterday. Has a history of asthma, when a much younger child, but under very good control, only uses a puffer occasionally. The ambulance has given Salbutamol nebs, 10 mmol of magnesium IV and a loading dose of Salbutamol IV. The first venous gas shows a pH 7.1 and a pCO2 of 98. This is the Critical Asthmatic. She is at the point that she needs intubation right now….almost. But we know that in this group of patients cardiac arrest peri-intubation is not uncommon and post intubation care is horrific. Intubation doesn’t fix the problem, it is of use when the patient can no longer breathe for themselves. Do not intubate, if at all possible. It will be horrific. These teenage patients tire, but not as easily. They can go on for a while, so there is a little bit of time, but only a little bit- so prime your team and go go go! Do not intubate if at all possible. Throw everything you have at the patient. This is the time to go in all guns blazing. We worked and worked and worked……….and then something amazing happened. Keep reading. A lot of what is done, happens in parallel, i.e., two to three things happening at once, but for the ease of writing, it is expressed as if in series. With saturations of 70% on room air, there isn’t a lot of space to move here. I’m not too worried about the CO2 at this point. We need to increase the oxygen and see if that works. Increasing the oxygen is good for the patient, but it will also help me in case I need to break rule 2 and have to intubate. If there is no oxygen reserve, this will be ugly! We use my old friend the nasal canula. We put them on under the mask delivering the salbutamol. I turn them up to somewhere above 15L/min, but probably closer to 60L/min. They don’t bother the patient at this point as she is CO2 narcotised. We then run the mask over this at 6L/min and deliver the salbutamol. The sats rise and rise, to above 95%. What about Non Invasive Ventilation(NIV) for this patient? NIV, although used in COPD and APO, is not used as often in asthma. The EPAP appears to assist the most. It has a direct bronchodilatation effects and can recruit lung units previously obstructed thus affecting V/Q mismatch. The EPAP helps offset intrinsic PEEP, decreasing the work of breathing. The IPAP assists tidal volume and decreases work of breathing. The patient has to be awake and working with the machine. Our patient wasn’t. I was concerned that with her conscious state, we would get significant breath stacking. What about High Flow Nasal Cannula(HFNC)? This is what we used. A HFNC at 60L/min was applied. The benefits of this system are it provides humidified 100% oxygen to the patient. It decreases CO2 rebreathing and washes out the deadspace, decreasing the CO2. It also provides some PEEP, around 7cm H2O thus recruiting alveoli and decreasing dead space. It also doesn’t need the patient to work with it. With other measures to be described below and the HFNC, a repeat gas some 20-30 minutes later showed a CO2 that had dropped to 63. Before putting on the HFNC, we were using continuous salbutamol nebs. We would put 2 x 2.5 ml i.e., 10mg in at a time. We had also added 500mcg of atrovent. With the HFNC, we switched to IV Salbutamol. Make sure the dosages are right. If you are in a predominantly adult Emergency Department, the dosages that make up the infusions might be too low. The dose of salbutamol is 5mcg/kg/min for one hour, as a loading dose and then 1-2mcg/kg/min. For our patient who was 60kg, we would need 60mcg/min or 3.6mg/hr. This is much more than the normal adult dose. Beware salbutamol toxicity, which can occur with both inhaled and intravenous therapy. It presents as tachycardia, tachypnoea and a metabolic acidosis secondary to lactic acidosis. This confuses me as the sick asthmatic presents this easy, so I’m never sure and just persevere. If you think it is a problem in those patients that are clinically better than our patient, consider reducing the salbutamol for a short time if it is a problem. Our patient had a mixed respiratory and metabolic acidosis, with a lactate just over 3 mol/L. We kept going. The patient had already had 10mmol of Magnesium by the ambulance service. We gave a further 10 mmol. Magnesium relaxes bronchial smooth muscles resulting in bronchodilatation. It also inhibits mast cell degranulation, thus reducing inflammation and decreases asthma severity by stimulating nitric oxide and prostacyclin synthesis. It can result in some toxicity and can result in absent reflexes, muscle weakness, respiratory depression and cardiac conduction abnormalities if given in large amounts. However if we aim for a serum Magnesium level of 2 mmol/L, it should be fine. Adrenaline has long been used for the treatment of severe asthma. It has the beta effects which cause bronchodilatation and the alpha effects which result in a decrease in oedema. It can be used in nebuliser form, intramuscularly or intravenously. My approach is to use it intravenously. In patients such as this one, the patient is shut down, dry and and intramuscular dose may not circulate as well as the direct intravenous route. I don’t tend to use it in nebuliser form, especially if I am using Salbutamol. My hope with the adrenaline is that it may balance any hypotensive effects that are occurring due to the magnesium and will allow bronchodilation and the salbutamol to get in. We had to stop the adrenaline after some time, as the blood pressure was rising significantly. This patient had salbutamol, adrenaline and magnesium running. The patient received 200mg of IV Hydrocortisone. This was done early. The literature will comment on the controversies surrounding the effect of steroids on admission rates and lung function. The reality is, that most of this literature doesn’t apply here. This patient is coming in. Steroids don’t work for some hours, but their anti-inflammatory effects are real and beneficial. They may have an earlier effect on beta 2 receptor upregulation. Once giving hydrocortisone, it may also be beneficial to add Methylprednisolone 1mg/kg IV 6 hourly. Very sick asthma patients such as our patient, have significant insensible losses. Fluid may be beneficial in a number of ways. It fills the patient improving their perfusion. If you do need to intubate, (but off-course you never will), it will support the blood pressure for you. We commenced Normal Saline 1L over 6 hours. There is no evidence for the use of antibiotics in acute severe asthma, however given that the patient had had a febrile illness with mild cough over the last 24 hours, we added them. Its an anticholinergic, blocking muscarinic receptors in airway smooth muscle and resulting in bronchodilatation. The patient received 500mcg via nebuliser. In the sick child a loading dose of 10mg/kg IV loaded over 60 minutes is recommended to a maximum of 500mg. Our patient received the 500mg of Aminophylline over 20 minutes. We didn’t use Ketamine with this patient, however we were prepared. It can help by removing some of the anxiety response from patients and allows them to improve their ventilation. However, it also has bronchodilator effects. The aim is to use a sub-dissociative dose as an infusion at 0.1mg/kg/hr. Take care not to use more than this, as once you get past the anxiolytic or analgesic dose, it can effect the patient’s conscious state. We were already at a GCS lower than we wanted, so we held off. The CO2 dropped on the venous gases, the heart rate was about 123 and the respiratory rate dropped. The patient’s GCS improved and she was able to converse in words and soon in short phrases. By the time the chopper arrived and we had her ready for transport out to a paediatric ICU, she was much improved. I spoke with the paediatric intensivist about it, before patient transfer and he had seen this before i.e., when you throw everything you have at a patient, they sometimes do very well in a quick turnaround fashion. What if….. we had needed to intubate? How would we have approached it? Most operators say that the intubation is usually not the issue. I think it is the first hurdle and most arrests occur at this point. They do so because the patient is dry and drop their blood pressure or because their oxygenation is poor and they have a respiratory arrest. My approach is to maximally oxygenate as much as possible. I use Ketamine and Rocuronium. The patient remains sitting with whatever you have on, i.e. BiPAP or HFNC. They get about 25% of the ketamine over a minute and we watch for a minute or two allowing it to circulate. Then the second dose is a 50% dose over a minute then watch. They patient then gets the last of the Ketamine and the Rocuronium at 1.2mg/kg lean weight and at about 15 seconds after the Rocuronium is in, the masks come off and the patient is only then laid down for the intubation. In terms of the procedure, I insist on a video laryngoscope in these patients and a rapid passage of tube with stylette already inserted. When the tube is in, confirm placement by end tidal CO2 and also perform a 3 point listen with the stethoscope to make sure it isn’t down one bronchus. The key here is permissive hypercapnia i.e., allow a higher CO2 and a drop in the pH, to avoid barotrauma. I remember the number 6- Respiratory rate = 6, Tidal Volume is 6ml/kg ideal body weight. You want to increase the expiratory time in relation to the inspiratory time, to minimise auto PEEP. After years of working in Emergency, sometimes seeing the not-so-acute patients, putting up with abuse and the less than collegial attitude of some inpatient colleagues, we sometimes can get a little jaded. It’s a case like this, that teaches us that we do make a difference, a real difference and that the knowledge we take into our shift DOES matter! We fall in love with the specialty all over again! NB: To the whole team that looked after this patient on the day…OUTSTANDING! Well Done! Very well done Dr Kas. I liked your management of this 15 yr old with life threatening asthma. Excellent article Dr Kas, loved it and loved it.